The Federal Government has approved a new budget support loan facility for 35 states across the country to help them meet salaries, pension and other infrastructure obligations. Each state will get N800m, summing up to N28bn. Of the 36 states across the federation, only Lagos was excluded from the loan. The budget approval was disclosed after the end of a meeting of the National Economic Council presided over by Vice-President Yemi Osinbajo at the Presidential Villa, Abuja. The Minister of Budget and National Planning, Udoma Udoma, revealed the information to reporters on Thursday, saying the Minister of Finance, Kemi Adeosun and the Central Bank Governor, Godwin Emefile have been instructed to effect payments. The minister stated that: “The Accountant General [of the Federation] reported to the council that approval has been received and CBN has been directed to pay N800m to each of the 35 states of the federation. Speaking on the balance in the Excess Crude Account, the AGF said the balance as at November 17, 2017 was $2,309,693,583.35, whereas the Stabilisation Fund Account as at November 17, 2017, was N6,689,072,836.11. Meanwhile, the Natural Resources Development Fund, the balance was N100,314,169, 190.23 as at November 17, 2017. On the recent state of the Nigerian economy, the minister said there have been indications of recovery being observed since Q3 2016 and the Recovery consolidated in Q3 2017 with GDP doubling to 1.40 per cent. He added that non-oil GDP contracted in Q3 2017 by 0.76 per cent after growing in Q1 R Q2 2017. According to Udoma, “Due to high inflationary pressures Household consumption expenditures remained constrained, although it appears such pressure was easing. Headline inflation has declined since January reflecting tight monetary policy while food price increases have remained persistent but slowing down. “The total value of capital importation at the end 2017 of Q3 was at $4.14 billion (131.3 per cent growth year on year),” he stated. Udoma also said: “The governors expressed appreciation to the Federal Government for the restoration of the Budget Support Loan Facility for July and August 2017,” he said. 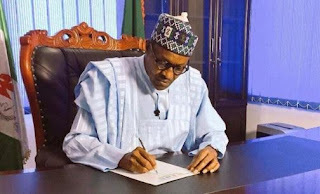 0 Response to "Buhari approves N28bn budget support loan for 35 states"